" What the bloody hell do you mean she&apos;s gone?!" Hermione screeched. " What happened?" " I think I know where she is, please, you have to come with me!" 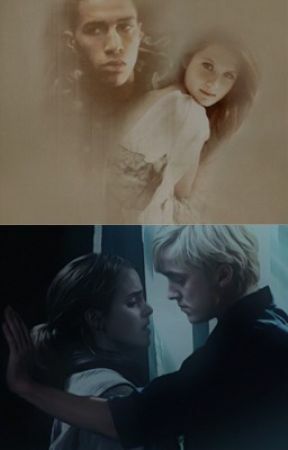 Blaise said desperatley and grabbed Hermione by her arms.
" Blaise take it easy. Of course I&apos;ll come with you. But first let me take my wand with me while you tell me what happened" Hermione said as calm as possible, even though she was freaking out inside.
" Death eaters, they came just like that. Attacked, took her, and disappeared"
" Harry told me something like that when Parvati was taken "
" Take your freaking wand!" Blaise shouted.
" I&apos;m on my way!" Hermione shouted back and took her wand and Blaise&apos;s hand and he disapparated with her. They were now out in the woods where Blaise and Ginny had played Hide and Seek. " How do you know she&apos;s here?" Hermione said worriedly.
" I don&apos;t " Blaise confessed. " But we have to try " " Okay. But we have to keep an eye on each other "
" Not that hideous person then?" When she heard that she hastily turned around and saw two dark figures further away.
" Bombarda!" Hermione yelled and shot at one of the dark figures. But she missed. One of the men shot the dead curse at her but Blaise blocked it for her. " Where is she?" Blaise yelled. " Where have you taken her?!" The man didn&apos;t reply, he just kept attacking at Hermione. " Why is he only attacking me?" Hermione asked Blaise while she blocked and shot back som curses at the men.
" Maybe he&apos;s only after you?" " Stupefy!" One of the men said and hit Blaise in his stomach. Hermione screamed and yelled " Sectumsempra!" Luckily it hit the man and Hermione breathed out in relief. Suddenly she felt how all her body suddenly relaxed and she fell down to the ground. She was paralysed and couldn&apos;t hardly breath. Someone lifted her up and disapparated away with her. Her last thoughts were on Draco Malfoy&apos;s grey eyes and how carefully he held her in his arms when he saved her life. Now she would never ever feel that feeling again, and never feel his lips against hers. Why? Becuase she was now taken too.